Rigzin Dorjee Rinpoche is a contemporary nyingma master, founder and head of the Nyingma Institute, Gangtok, Sikkim, India and the Nyingma Retreat Center, Martam, Sikkim, India, and a main student of Chatral Rinpoche. Rigzin Dorjee Rinpoche was born in 1954. At the age of fifteen, he was ordained monk and studied at the Higher Buddhist Institute in Varanasi, India. He graduated with the degree of “Acharya”, master in philosophy. Rigzin Dorjee Rinpoche is the founder and head of the Nyingma Institute, Gangtok, Sikkim, India and the Nyingma Retreat Center, Martam, Sikkim, India. In 1998, Rigzin Dorjee Rinpoche founded Longchen Nyingtik Institute, USA. 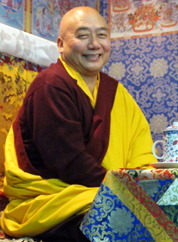 He has also taught extensively in institutions, universities and other Buddhist centers in Bhutan, Nepal, India, Canada, the Netherlands and USA. Today, Rigzin Dorjee Rinpoche is one of the main lineage holder of the Rigdzin Sokdrup tradition. ↑ Most of the information are based on the official biography founded on the website of the Nyingma Institute Taktse Education. This page was last edited on 23 July 2014, at 16:55.